EarthSoft’s Data Acquisition software products for the collection and processing of data are available from a variety of sources and methods. Data is made ready for import into the EQuIS database through integrated workflow automation. 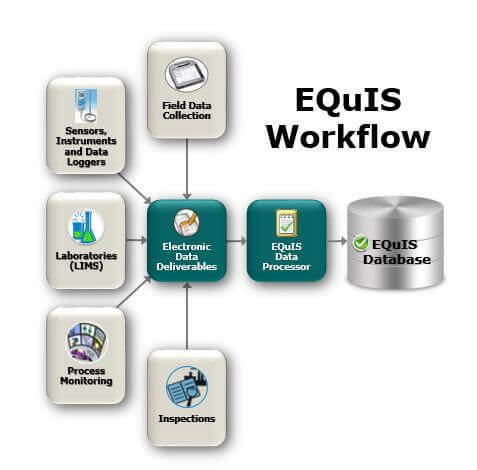 EQuIS Data Processor (EDP) is a critical tool for organizations wanting to automate the receipt of laboratory and field data, and is used by hundreds of laboratories, consultants, and government organizations world-wide. EDP is the world’s EDD “traffic cop”. EDP can check spreadsheets and is available standalone, in EDGE, in Professional, in Enterprise, and on dashboards. EQuIS Data Gathering Engine (EDGE) is powerful software ensuring accurate and complete field data collection events. EDGE includes EDP for live, real-time error checking of data submissions. EQuIS Live, although not a Data Acquistion product, is available with Enterprise Gold and manages real-time and time-series data from sources such as data loggers, sensors, and other Internet of Things (IoT) sources.